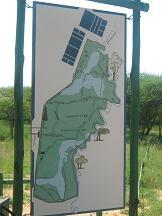 The Gaborone Game Reserve is more of an educational nature reserve. 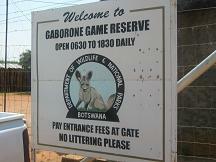 It was initially set up to enhance conservation awareness in Gaborone and the surrounding areas. Since the game reserve is located within Gaborone , it has no predators and other large animals that are potentially dangerous such as elephants. During the dry season, game viewing is best done early morning and in the evenings. During the rainy season , anytime is perfect for viewing game. The Game Reserve is busiest during the weekends. This is when most of the local people are off work and have time to go on excursions. The opening times are from 6:30 in the morning till 18:30 everyday of the week. There is no need to make a booking in advance. Park fees are very affordable. Adults pay P10 and children the age of 17 and below pay P5. If you are using your own vehicle there is an extra vehicle fee of P10. There is a barbecue area with chairs inside the reserve available for use. As well as water and toilets.